We all know those couples that just seem like they’re meant to be together. Sometimes it’s a shared and goofy sense of humor and sometimes it’s a hobby that only the two of them seem to share. If you’re single and come across a couple like this, it’s real easy to start feeling even more lonely than ever. Don’t let sour grapes get you though. Just enjoy the fact that these people clearly found their perfect matches and hope that you will soon too. It’s important to have similar ideas of what a Sunday after a night out should look like. If you’re a ‘lay in bed all day and move as little as possible’ type person, it’s probably important you don’t date someone who’s a ‘run five miles on a Holiday just for fun’ type person. This is what perfect synergy on that issue looks like. Bliss. Here’s the problem with people who struggle to make decisions when you ask them a question. They think they’re easy going, but really they’re just protecting their ego in case they say something that you don’t want to hear. So when asked whether he should wear a suit or a nice sweater and she doesn’t pick, then she deserves for you to wear whatever you want. 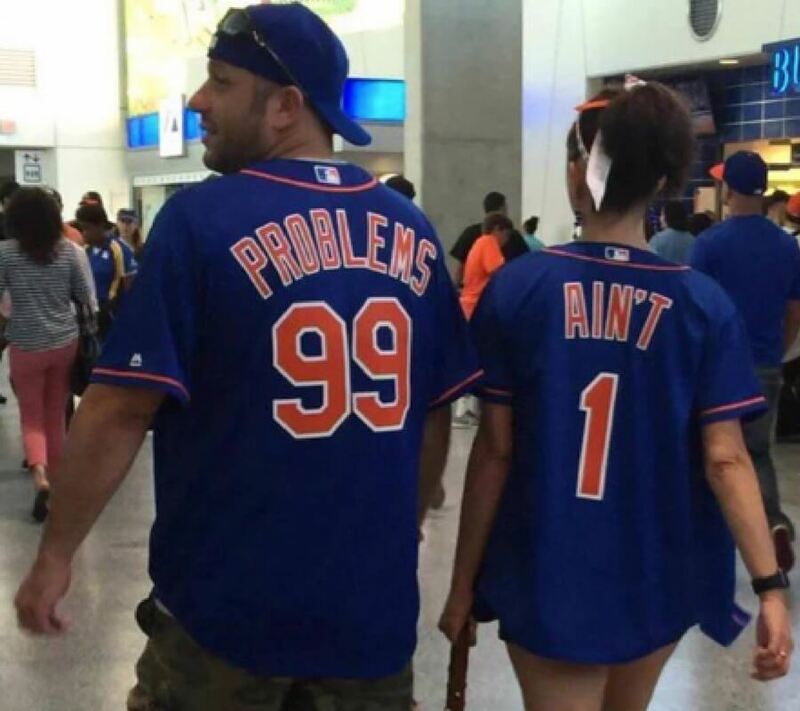 Couple’s jerseys are becoming more popular. This one just ahead on the list takes the cake in my opinion though. Anyone who’s ever been to a festival or an outdoor convention knows that it’s so easy to lose your loved one in the crowd. In fact, it’s more surprising if you’re able to keep them around the entire festival by the end of the day. 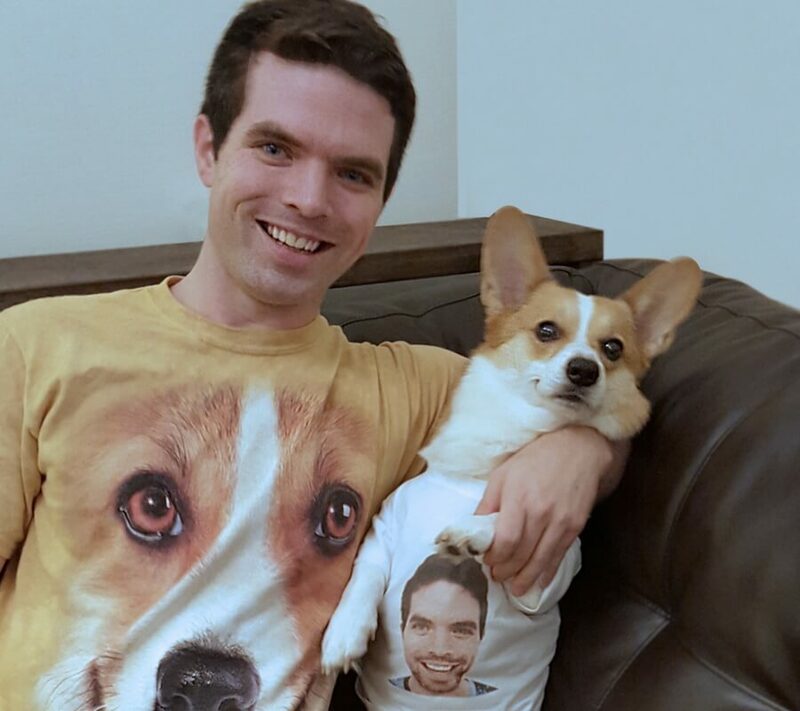 These shirts are the future. 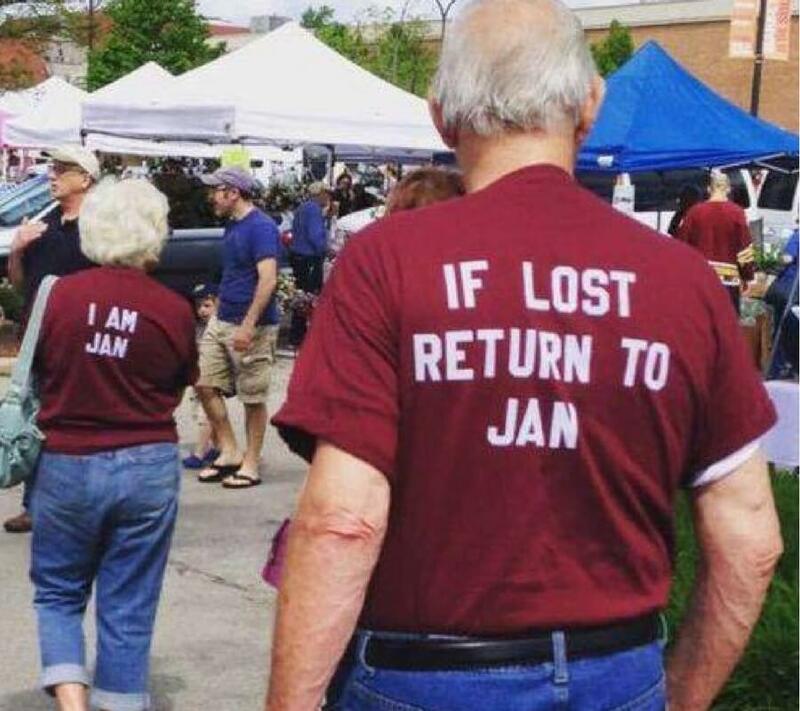 This couple is living in the year 2056. Statistics show that the grocery store floor collects the most bacteria out of any other surface on the planet. Yes, even more than your belly button, which has been suctioning lint into it since you’ve put on the first baby jumper. My statistics have no proof, but just assume it’s true. This is another couple who will NEVER have to worry about collecting that grocery store bacteria. It’s smart. Love is based solely on hate. Hear me out. 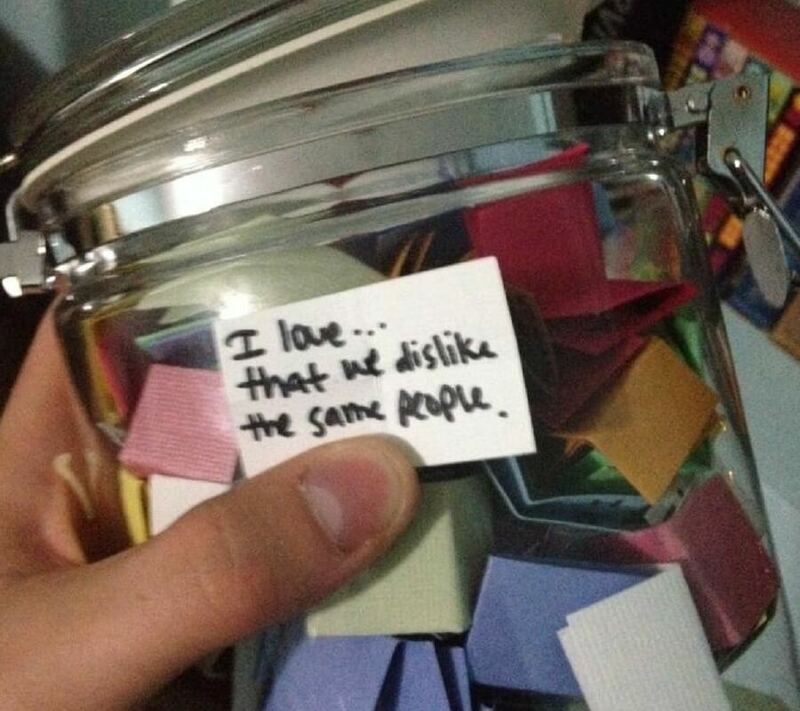 A relationship cannot last a lifetime if you and your partner don’t hate the same things and the same people. For example, if you LOVE eating Mcdonald’s but your girlfriend will only eat Wendy’s and neither of you are willing to concede, it’s over. Likewise, if one of you likes your neighbor Jeff, and the other despises him, it could be a serious problem. 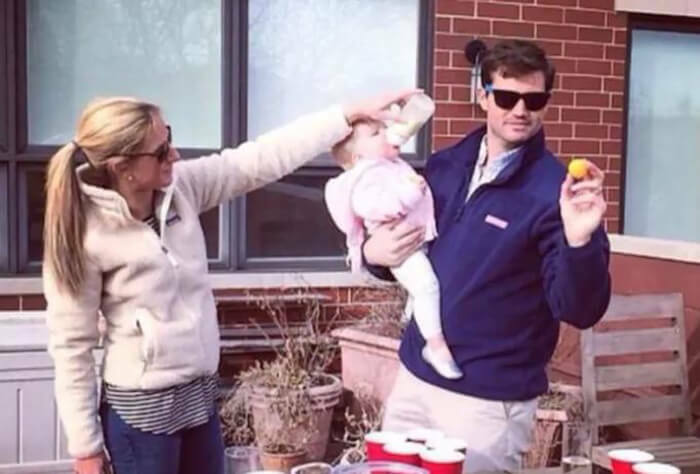 While you’re at the bar downing drinks so that the weird guy from high school who did the morning announcements every morning instantly becomes more attractive, this couple literally fits together. Get you a guy who has just enough of a dad bod to seamlessly fit into your lower back like Ikea furniture. It’s not hard to get a dog to love you. By no means am I assuming that these two are in a relationship, but I will say that their love for each other is the envy of many couples who have been married for 40 plus years. It’s a bold statement to have someone’s picture on your chest because it basically means you’re their property. That’s why I have a lot of Ken Bone shirts. Get you a relationship that allows you to not have to walk during grocery shopping. There’s nothing worse than having to lug yourself around those grocery aisles when you could be riding in style on the back of a cart. This lady’s feet haven’t touched a supermarket floor since 1986 and it’s going to stay that way. Being in a solid relationship means that you are aware of every benefit they can bring to the table. For example, this girl’s boyfriend has a flat forehead… like, abnormally flat. 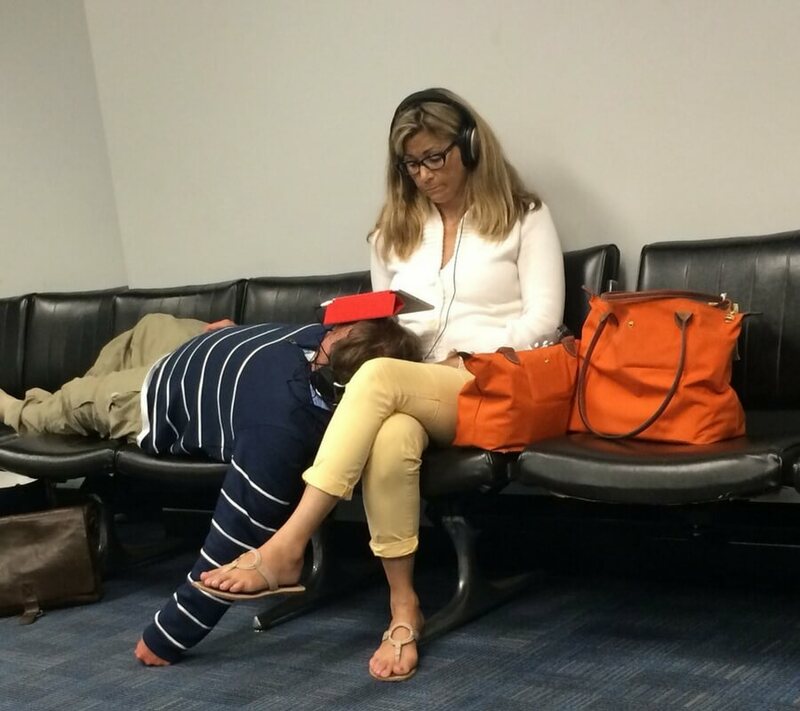 So, she is taking advantage of it by using his head as a desk which is exactly what she should be doing. 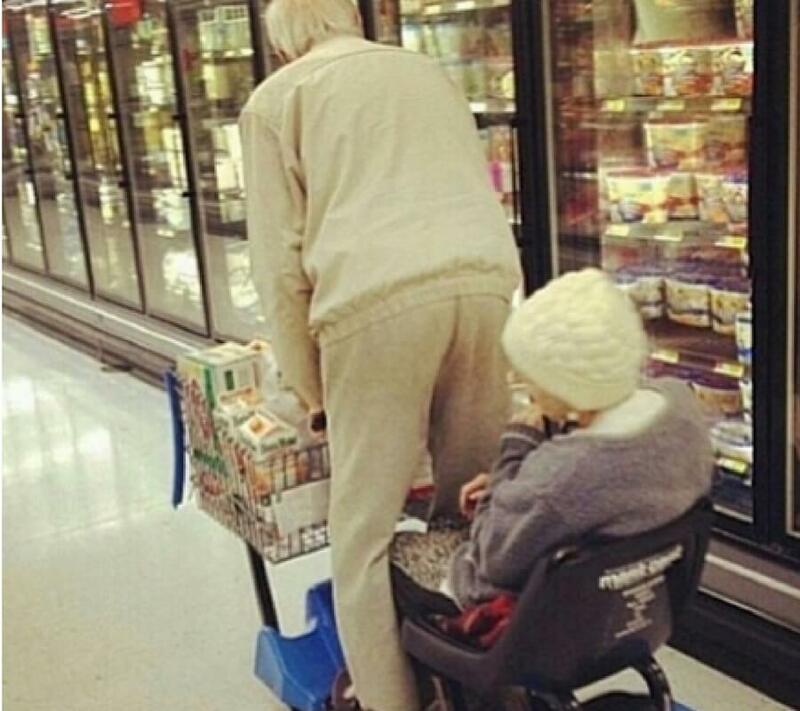 Kudos to this type of relationship. I didn’t realize how important it was to tell everyone your problems in the form of a couples jersey. Here’s the issue with couple’s jerseys though — if you go alone to a game (say with the guys or with the girls) then you’re just going to be walking around confusing everyone. To each their own I guess. If you can’t have an uncomfortably hilarious face swap with your partner, are you really going to last? That’s coming up. The secret to a lasting relationship in these technological times is to be able to execute a really good face swap. 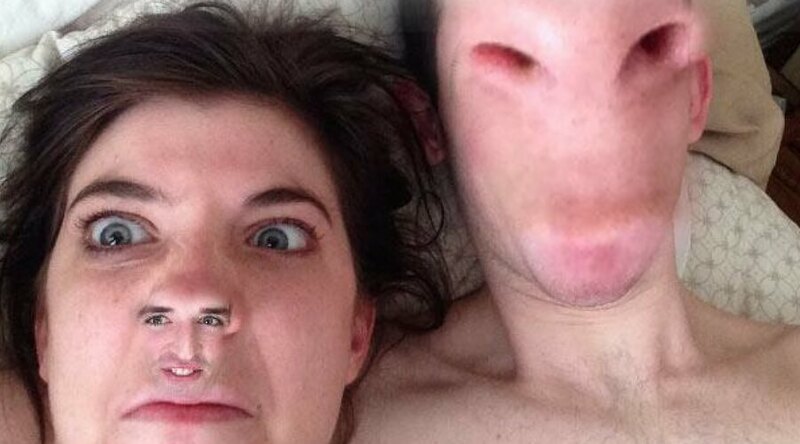 If you can’t face swap your nostrils onto your significant other’s face then you might as well just call it quits there. This couple has a bright future ahead of them if this face swap quality has anything to say about it. 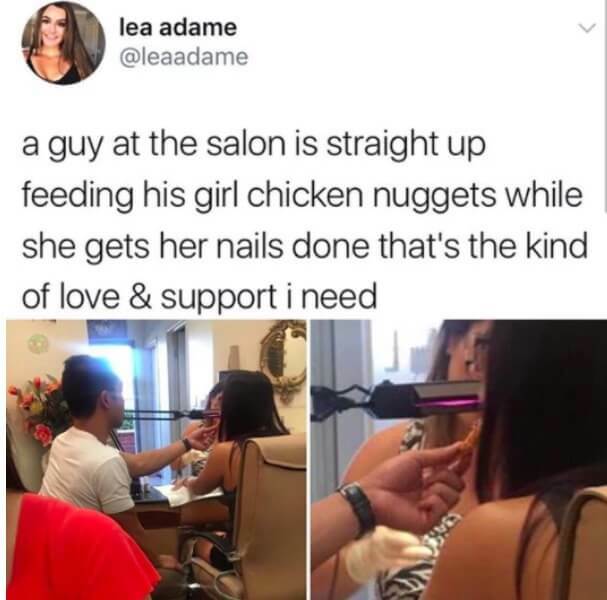 Coming up, a boyfriend that will feed you chicken nuggets while you’re getting your nails done. 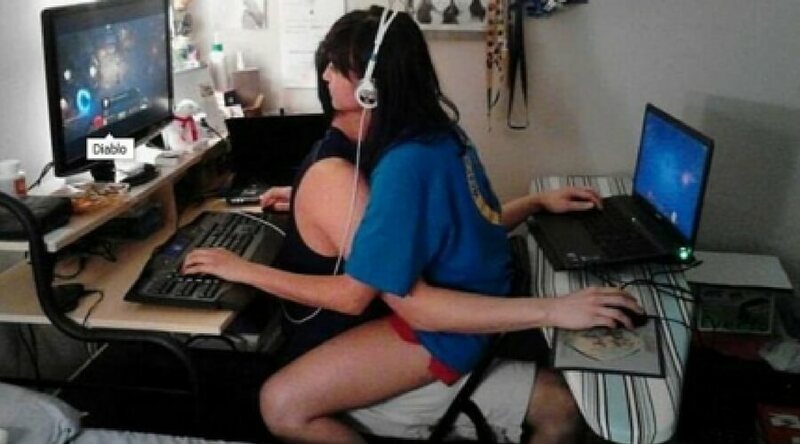 Gamer couples are a rare breed, but they always come in hot with the innovative ways to connect outside of the virtual world. Not going to lie, this kind of grosses me out on just a hygiene level because they probably spent six hours at least in that position and sweat is going to run rampant on both of them. This shows that these two are destined to have a long relationship ahead of them. 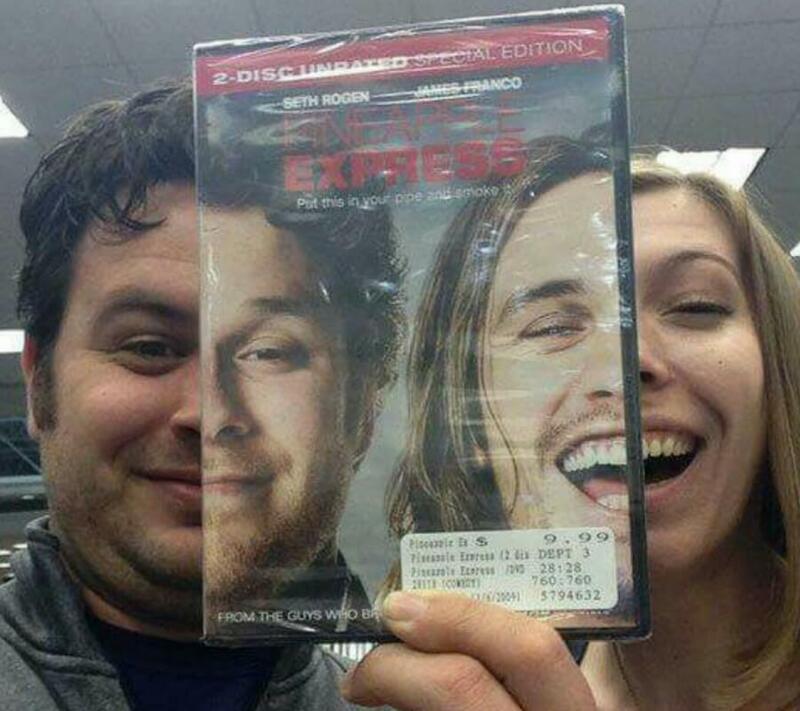 This proves they are best friends, similar to that of Seth Rogan and James Franco in Pineapple Express. This is insanely creative and deserves every relationship award and accolade that are out there. You need to find a partner who knows how to share a couch and isn’t afraid of your nasty feet. This couple is perfectly interlocked and you can tell this is something they worked on and at this point is just routine. They have perfect leg formation, and they both are able to bury their feet enough to not gross each other out. The next time you go on a first date, you’re first question (or litmus test) as to whether there will be a second date revolves around this. If he isn’t willing to feed you chicken nuggets, or at the very least popcorn while you get your nails done, then he can see himself to the door. It’s the thought that counts, right? Just wait till you see this picture coming up. The dedication of this portrait deserves a lot of praise. Not going to lie, I’d be a bit creeped out every time I passed by it, but nonetheless, this is a relationship masterpiece. I don’t know what kind of wizard you would have to be to make something like this but whoever it was isn’t apart of the human race. Everyone has had to take care of their significant other at least once or twice during a night out. Maybe one too many tequila shots result in an early bedtime. It’s not always that fun to have to take care of that person, but there are options you can take to make it fun. For example, you can literally put her in different scenarios. This is hilarious. Okay, so this relationship is either going to last a day or last a lifetime. If the girlfriend is someone who goes by the motto “it’s the thought that counts” then this is going to light up her soul. If she isn’t, well, this might be a quick visit to dump-city. Let’s just hope it wasn’t the latter. This is certainly one of the cutest things you’ll see all day. It’ll make you believe in love that lasts a lifetime. 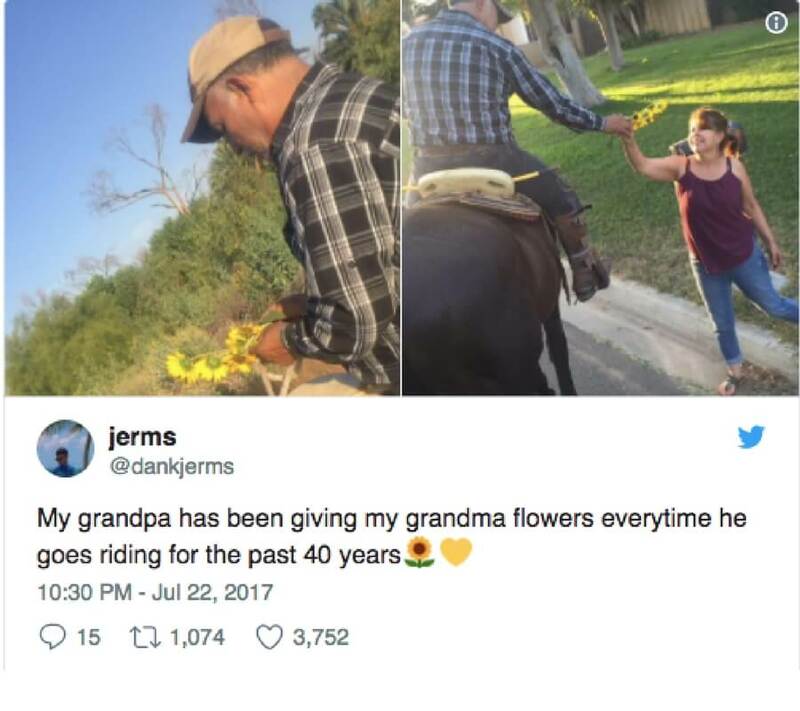 It will also make you wonder what she’s been doing with those flowers for the last 40 years. Let’s do the math. 365 days a year for 40 years. That’s approximately 15 thousand bouquets of flowers. These are the questions we need answers to. This is what happens when you give some moms a little bit of wine. She locks in on her Target (pun intended) and there’s no stopping her. If you think she didn’t come back with three body pillows and two living room lamps than you’re wrong. While some get drunk and want to dance on the bar, others want to dance in the aisle of department stores. As a husband, it’s about being able to adapt to either. 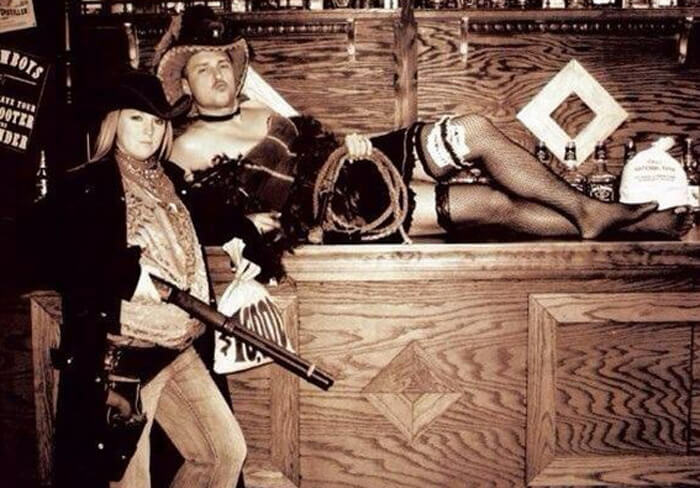 Nothing says romance more than cross-dressing and having a wild wet photo shoot. However, this might be one of one of those photos that they keep away from their kids until they’re old enough.We wonder what the photographer was thinking when they asked to pull this one off. When girls dream about the perfect boyfriend, this it. He knows what this girl is going to want in her time of need and he prepared for it. 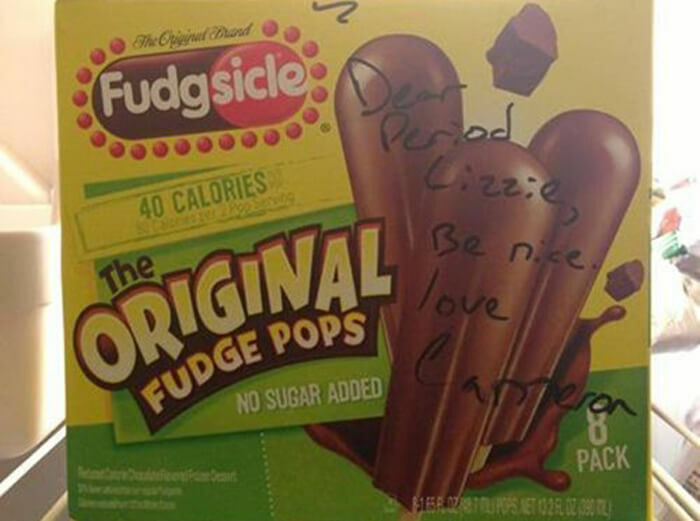 He’s also looking out for himself by leaving this little reminder for her. This is a smart dude. 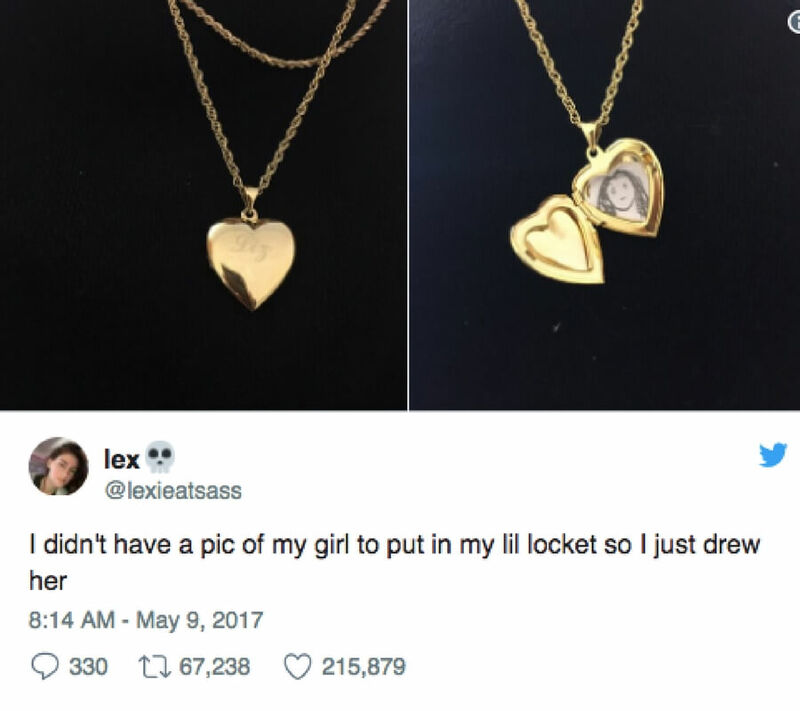 We need more guys like this in the world to boost the male genders reputation. 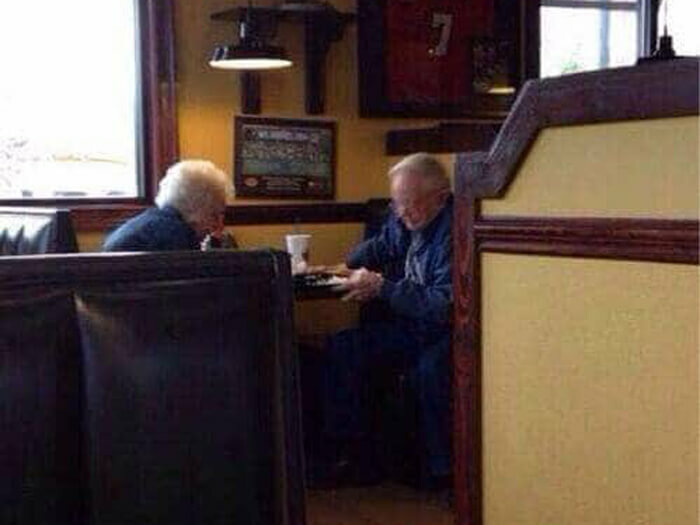 This couple looks like they’ve been going strong for years with no signs of slowing down. 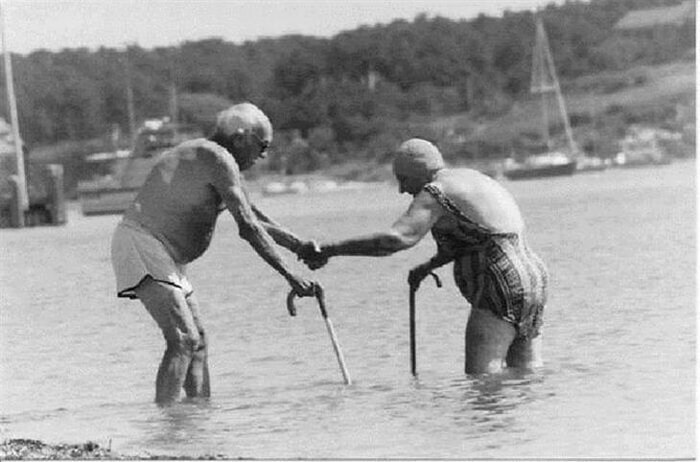 They are living proof that growing old doesn’t mean that you have to become boring. 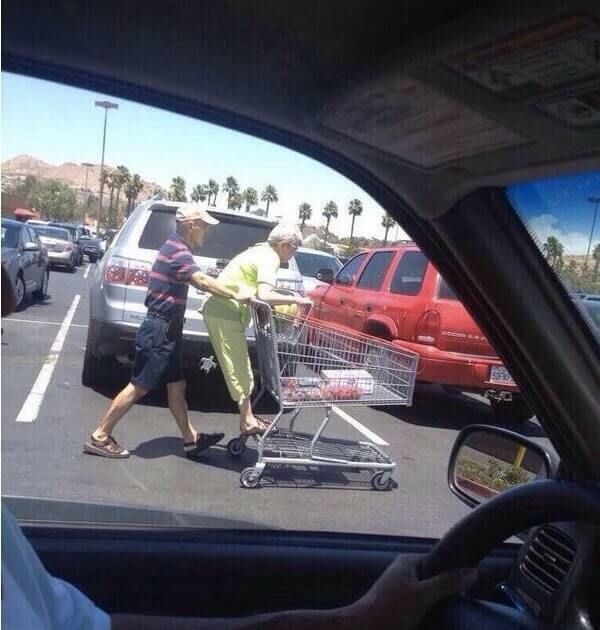 This is what some people call “relationship goals” and can only hope they end up like these. 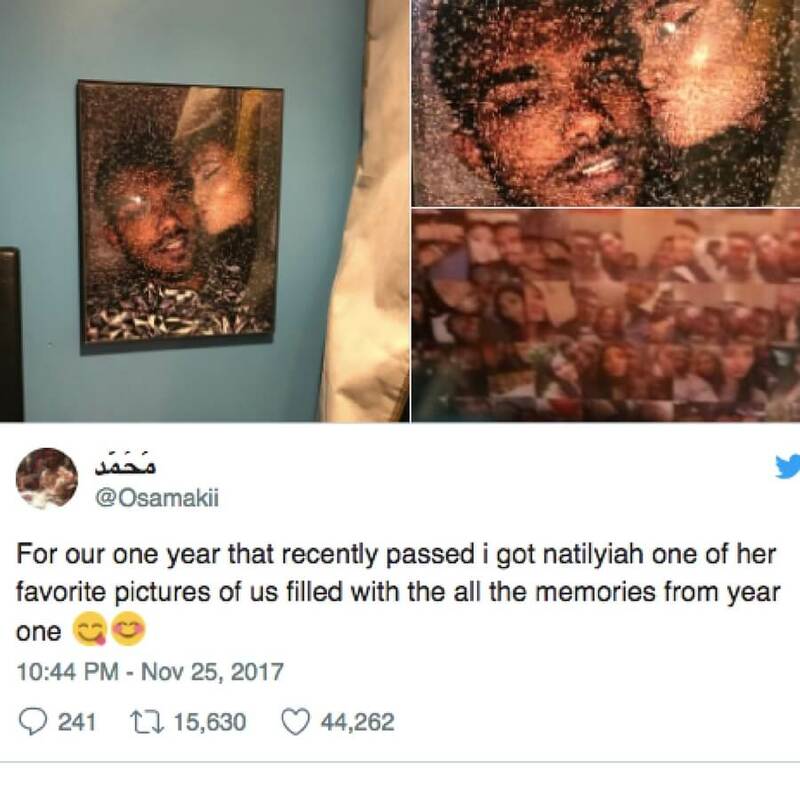 People wish that they could be as honest with themselves as this couple. 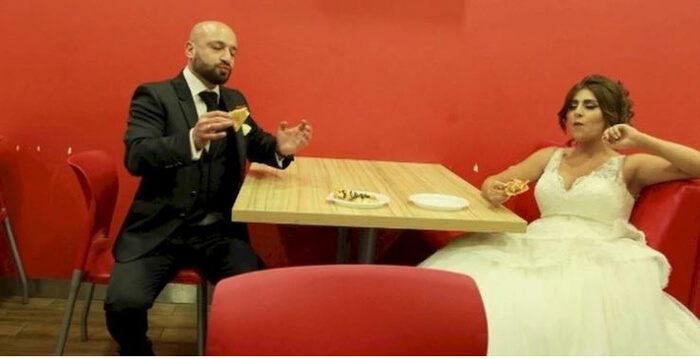 After their wedding, instead of rushing off to a fancy hotel room, they hit their favorite local hole-in-the-wall food joint. They look as happy as can be and are kicking off their life together the right way. This couple has it all going on in this picture. Looks like they figured out a way to take advantage of her situation and make the best of it. 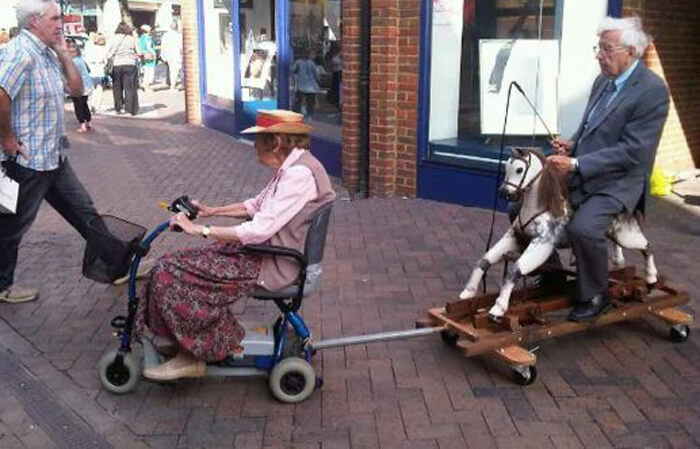 Seeing this couple roll down the street must be quite the scene, especially with the man holding a riding crop. Apparently, this elderly couple was sitting at a restaurant when the man sneakily attempted to steal one of his wife’s chicken fingers when she wasn’t looking. She responded by throwing a french fry into his face. The two then proceeded to kiss. Something tells us this wasn’t the first time something like this has happened. We’re going to assume that these two met in college and that at the time had no idea that this would one day be their life. But their not going to let a child crash the party for them. So they are making the best of it and the party rages on. 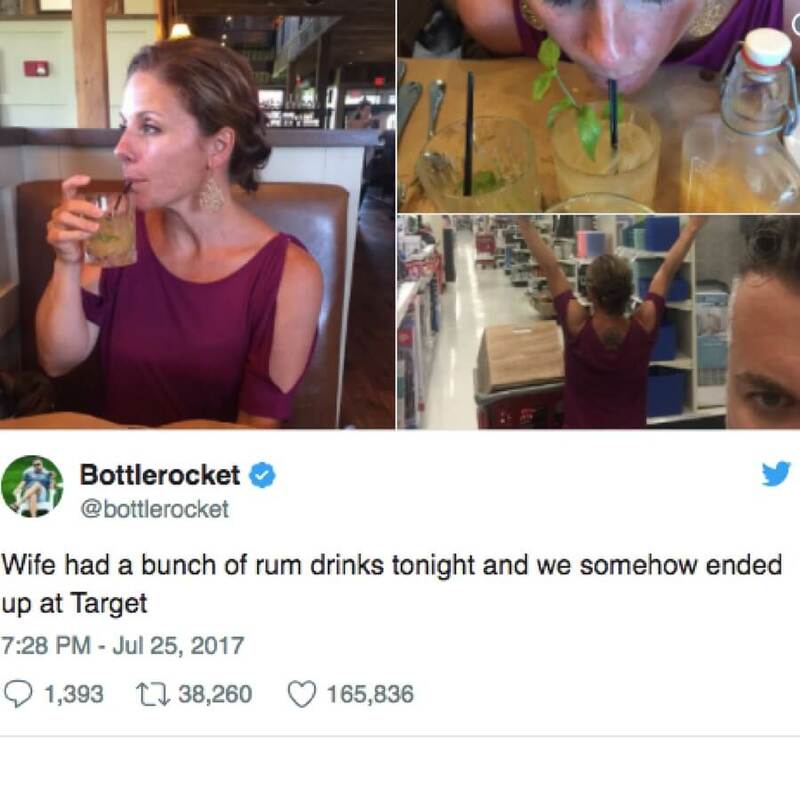 These two have the priorities straight. While their other friends are either getting married and having babies or still getting blackout drunk at Taco Tuesday, they’re taking maternity photos with a burrito. Was hiring a professional photographer worth it? Absolutely. 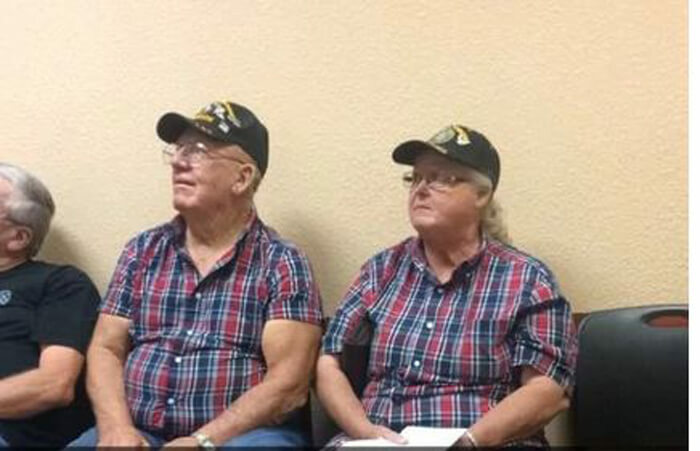 You know you’ve reached the peak of your relationship when you and your significant are wearing matching. At a glance, it may be difficult to tell the two apart, but maybe that’s what they’re going for. If they match every day, shopping would be a breeze. 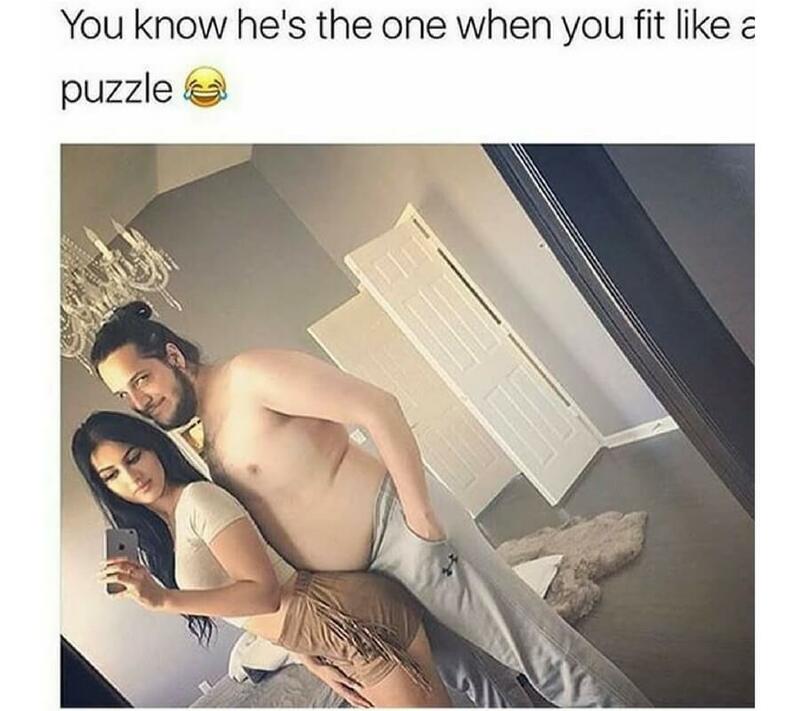 Maybe they even wear the right size! We wonder which one of these two had the original idea to do this. 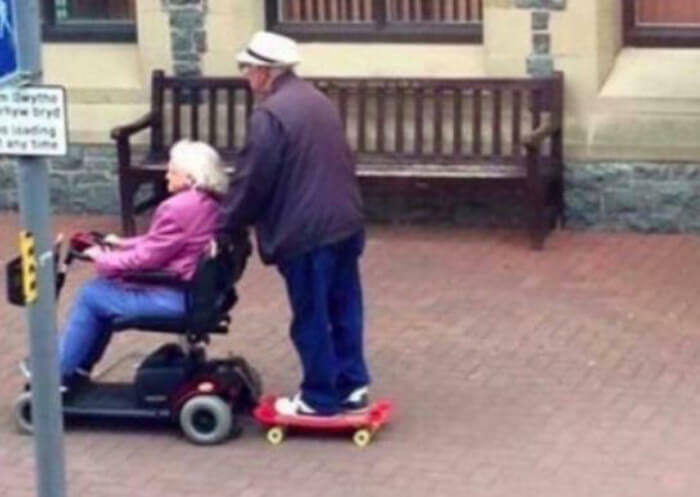 We like to think it was her who said something along the lines of “hop on loser” and he ran to dust off his old shred stick in the garage. Then, the two hit the streets for an afternoon ride. Maybe they’re on their way to the skatepark. If true love is scaring the pants off of your significant other, then these two are definitely in love. This man’s wife taped this picture of her onto the mirror so it looks like she’s hanging on while he’s driving. 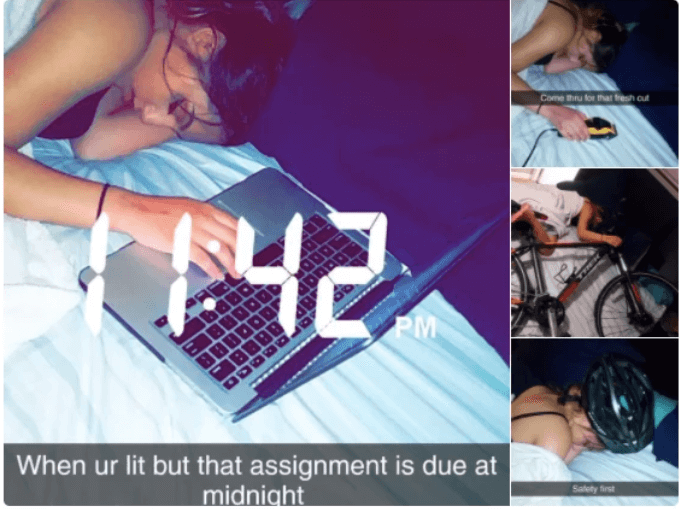 This is a very clever prank and we hope that he forgave her for it. 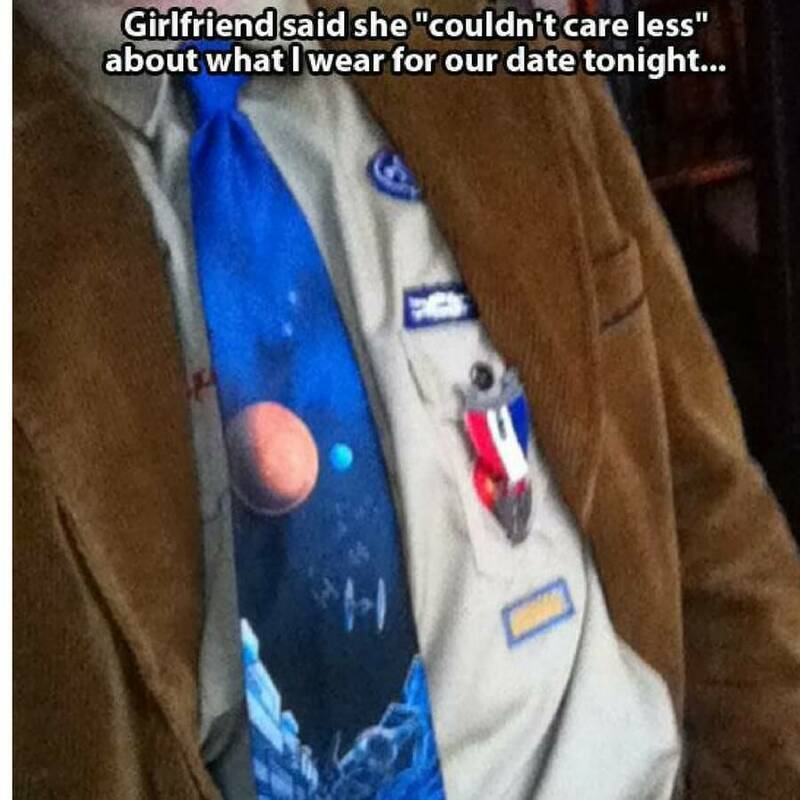 This guys girlfriend has him all figured out. Apparently, when the two are having an argument she pulls out her phone to take a selfie. He doesn’t like that very much and can’t take himself seriously anymore. That’s one fast and sure way to end an argument. This man’s wife refused to wake up and get out of bad. So, he did the only reasonable thing and made the bed on top of her. 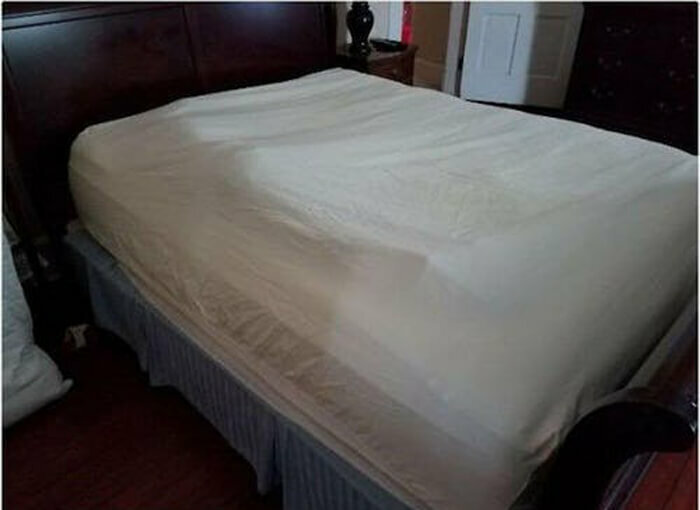 She’s going to be pretty confused when she wakes up, but she also should have listened to her husband! Maybe she’ll still be there when he gets back. 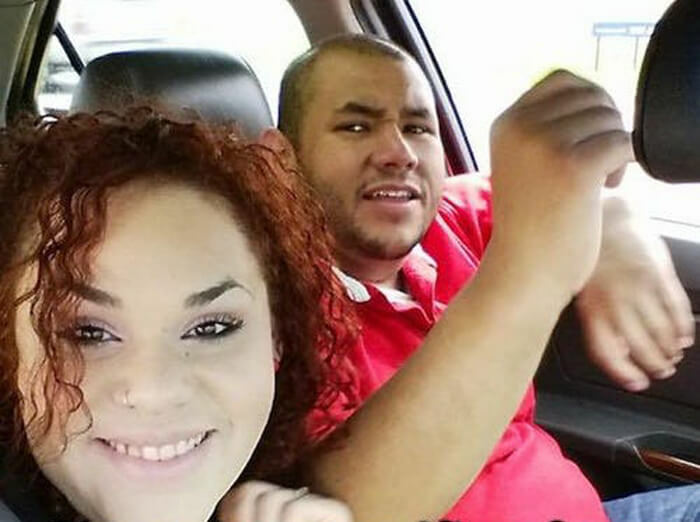 This couple shares a deeper bond than just love. 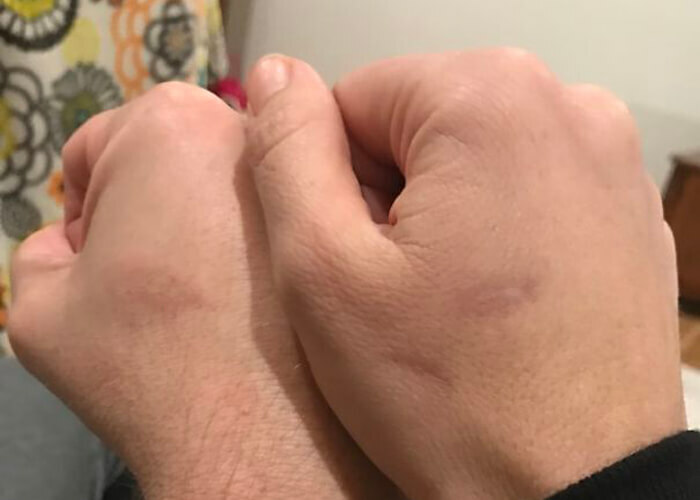 They also share the same scars from their toaster oven. These burns are forever while rings are just a temporary piece of jewelry. Hopefully, sharing similar burns doesn’t become the norm among married couples, because those look like they hurt. 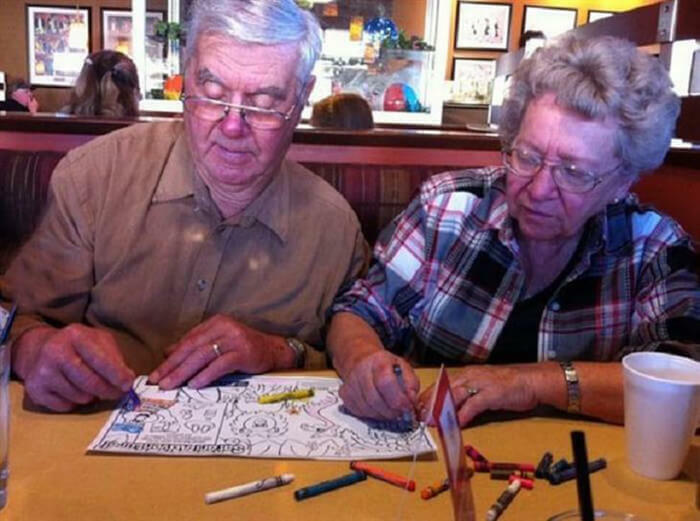 This elderly couple is spending some quality time together coloring at a restaurant. We wonder if there’s a little kid at the table and those are for them, or if they personally asked for one for themselves.They both looked very focused and skilled, so this probably isn’t their first rodeo. 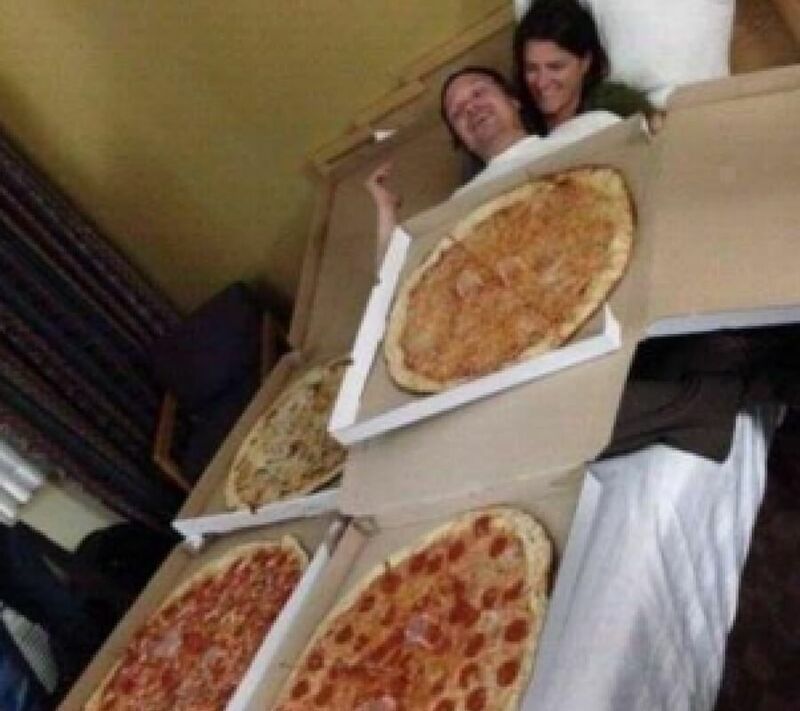 This couple is living the sweet life. Nothing sounds better than sitting in a recliner chair and drinking a cold one all while your husband is driving a quad. By the looks of it, this is probably a normal thing. Maybe they’re going to get some groceries, or they just ran out of beer. 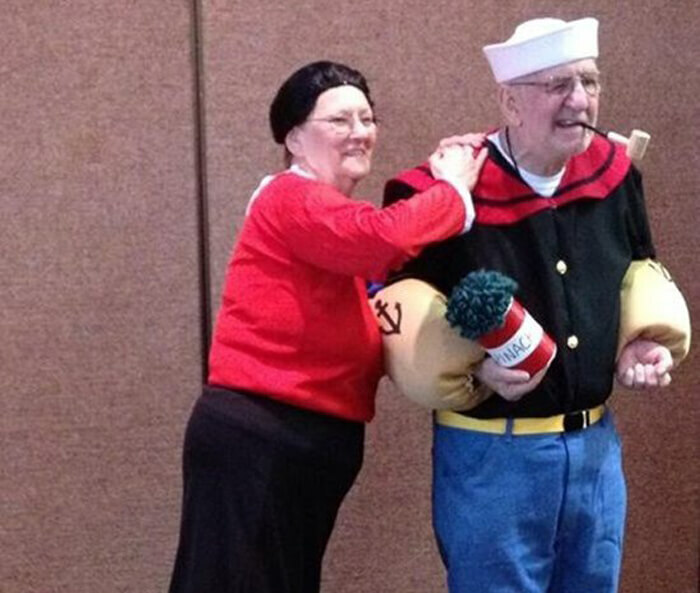 These two aren’t letting old age take them away from having fun. Together, they hit the water canes and all to enjoy the day. They’re even using each other for support. You can really tell how much they love each other from this picture and we hope he doesn’t let go of her as a joke. 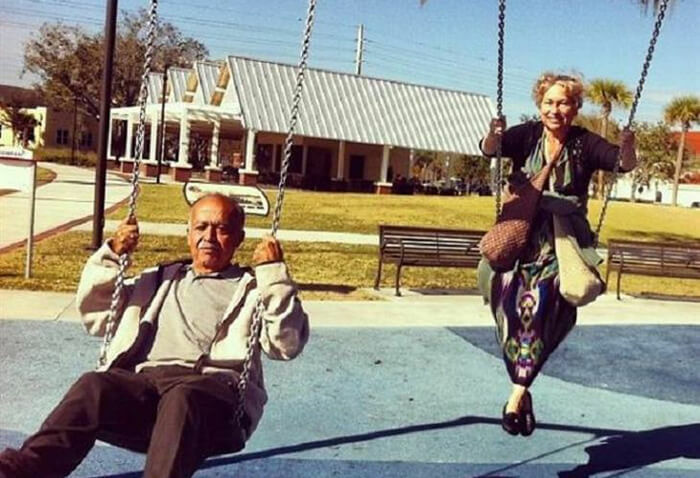 This couple is proving to all of us that you’re never too old to enjoy yourself on the swings. When you’re little you love the swings but at one point you just stop. 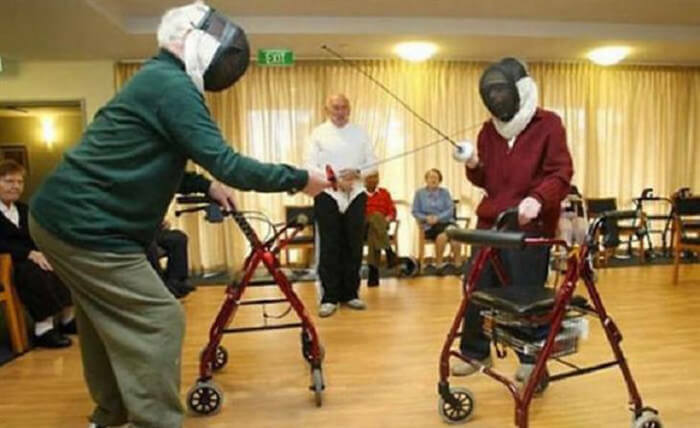 These two decided to get back into the swing of things together which isn’t something every elderly couple does together. 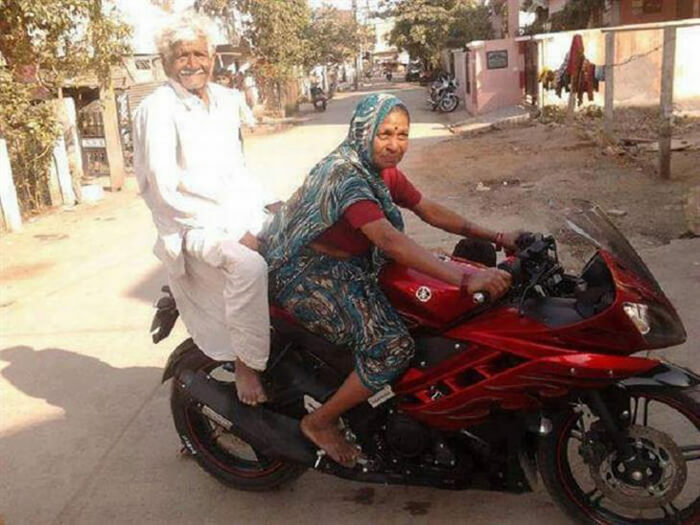 Better get out of the way, because these two look ready to burn some rubber on the road. 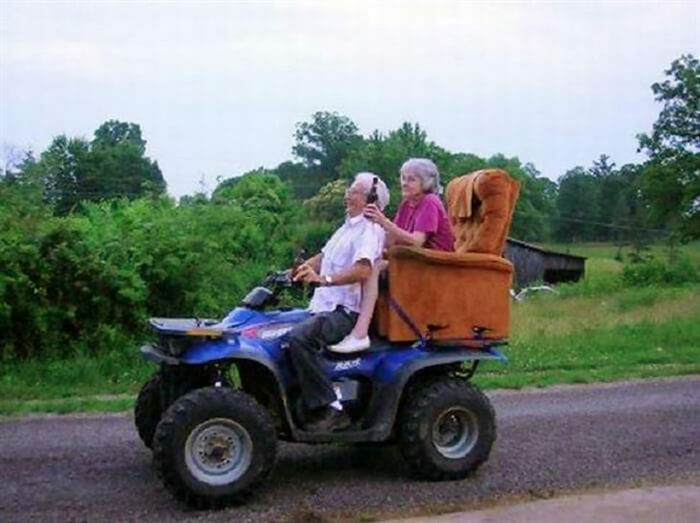 She certainly looks confident in her driving skills, so he better hold on tight before she drives away. They both are making a bold move by going shoeless on a motorcycle but they don’t seem to mind. This is impressive no matter what, however, if this is how this couple settles arguments, we’re blown away. They look ready to leave it all on the floor and the loser is making dinner that night. This is a showdown that you don’t want to miss. Who will be the winner?